Transform your skid steer, compact track loader (CTL) or compact wheel loader into an efficient milling machine with the latest addition to the John Deere Worksite Pro attachment line-up, the D-Series cold planers. 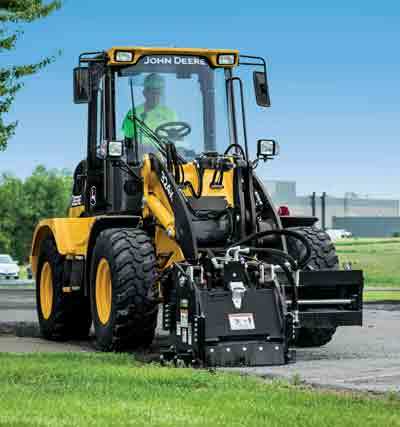 These attachments are ideal for customers performing street repairs, matching uneven pavement surfaces, cutting drainage in parking lots and cleaning up around larger milling machines. The four new D-Series models (CP12D, CP18D, CP24D and CP30D) offer increased performance and productivity, delivering up to 10 percent more cut rate over their C-Series predecessors. The exclusive angled soil-guard design prevents the wheels from riding up and over millings. Significantly reduced rolling resistance also increases cutting force and makes the attachment easier to maintain control over the depth of the cut. Increased weight on the new models helps keep the planer in place and reduces bounce, for a smoother cut, while the planing-drum mounting enables closer planing near curbing. The tilt can be adjusted independently to allow planing on both the left and right sides of the machine. Uptime boosting features include protective shields for electrical and hydraulic components, solid hardened-steel wheels and cylinders that are positioned up and out of the way of obstructions and debris. The front door opens forward, providing easy access for pick inspection and replacement. With the universal, self-cleaning Quik-Tatch easy attachment system found on all John Deere skid steers, CTLs and compact excavators, the machine can easily add and remove the cold planer in no time. The new attachment series is also backed by John Deere parts, service and warranty coverage.